I love our back deck. It's green with plants, citrus trees, and flowers that drive hummingbirds crazy this time of year. It overlooks the garden and the fields beyond. I've watched seasons pass sitting in our wrought iron chairs. Having said that, the feng shui has always been a little off kilter. It was hard to put my finger on, but I felt it. Back in the spring Jilda and I sat out there early one Sunday morning dipping chocolate biscotti in our coffee. 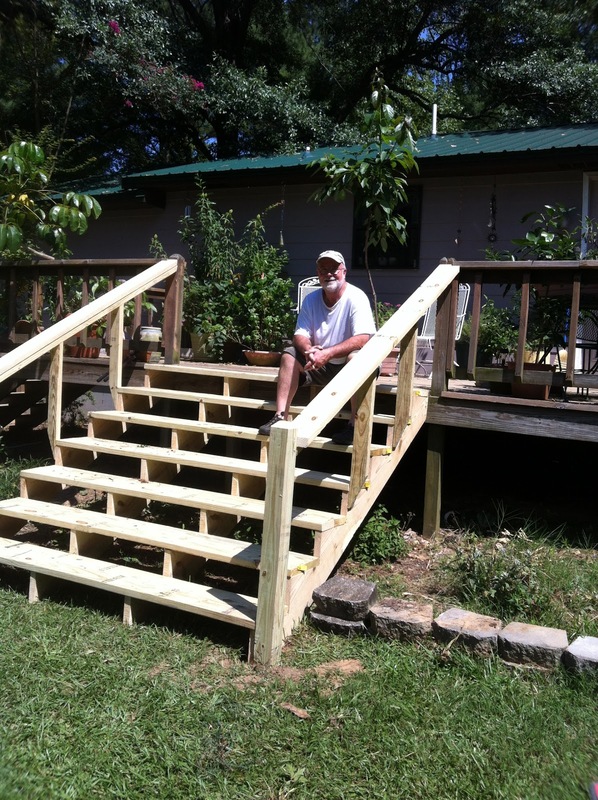 Out of no where, Jilda said we need new steps off the back of this deck. The original steps were to the side which made it closer to the driveway, but as I sat there I realized she was right. I called our carpenter who came up and wrote me a material list. The building supply delivered the wood this week. When I called the carpenter to get on his calendar, he asked if I minded if we worked on Sunday. 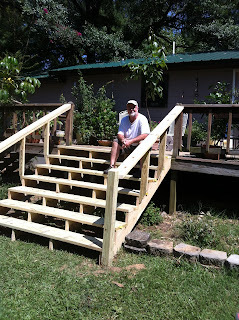 I'm normally slothish on Sunday, but I really wanted the new steps built. If we had passed on this date, it would be weeks before he could do the work. He was here this morning before I had my second cup of coffee and we got to work. A few hours later, Jilda snapped this photo. I was a tired puppy because I do most of the grunt work for the carpenter. Tonight as we sat out on the deck and watched the last traces of amber disappear from the western sky, we both realized that the deck feng shui is just right.